barismo: Cupping high grade taiwanese teas. Checking the leaves after the cupping which were very intact, undamaged and pretty. Thy expanded with each brew until being fully unfurled. 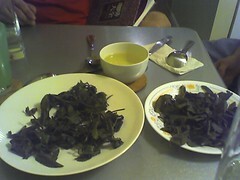 Dha yu ling and a Pear mountain tea from taiwan. Each taiwanese tea was high grown and sells for $100 per 5.5oz. These teas were both at the base very sweet and intensely floral. Pear mountain - pear, cinnamon, mint, honey, super creamy, and lemon drop aftertaste. Dha yu ling - molasses, cinnamon graham cracker, clean cucumber, grape soda aftertaste. Summary: We don't drink teas like this in the states! Silas needs more of these! The sweet aftertastes linger in a super sweet clean flavor for many minutes afterwards. UPDATE: I realized that after this cupping we had to rethink everything one more time. If the tea industry is this advanced in Taiwan, then it means this is where the coffee industry should be or will be going. It's scary to think but maybe that's what it's about. The tea's were expressive, amazing, and complex. They were worth getting excited about. They were more complex than any tea I have had. Granted I have visited china and Japan but these blew down any of those expereiences by a long shot. It was strange how you could taste layers of flavors in the cups. Tea has this potential? That's something to think about. Big cheers to Ben's dad in Taiwan for arranging them!